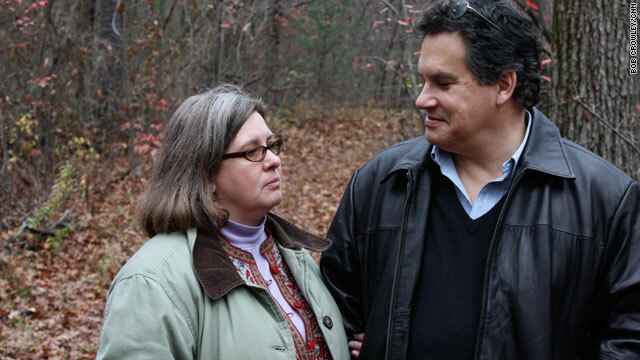 Debra and Christopher Bader revisit the spot in the woods where Christopher collapsed after going into cardiac arrest. Debra saved him with compression-only CPR done to the beat of the disco tune "Stayin' Alive." Heart association says to perform chest compressions to the beat of "Stayin' Alive"
This Empowered Patient column originally was published on July 2, 2009. (CNN) -- Debra Bader was taking a walk in the woods with her 53-year-old husband one morning when suddenly he collapsed. At first she thought the situation was hopeless. "I looked at him and said, 'He's dead,' because he wasn't moving or making any sounds at all," Bader remembers. "But I pulled the cell phone out of his pocket and called 911, and then a public service announcement I'd heard on the radio popped into my head." The one-minute PSA from the American Heart Association instructed listeners, in the event of cardiac arrest, to perform chest compressions very hard to the beat of the 1970s Bee Gees song "Stayin' Alive." When someone suffers cardiac arrest, as pop singer Michael Jackson did last week, the heart stops functioning completely, and brain death begins within four to six minutes if the victim doesn't receive help. "I sang the song and gave directions to the EMTs at the same time. It was like, 'Stayin' alive, stayin' alive -- take a right here, take a left here -- Stayin' alive, stayin' alive -- take this path down here -- Stayin' alive, stayin' alive,' " Bader remembers. For 15 minutes Bader, who had never taken a CPR class, pumped her husband's chest until the ambulance arrived and the EMTs delivered a shock to his heart with a defibrillator. Christopher Bader survived, but 95 percent of people who go into cardiac arrest die before they get to the hospital. "She's a real hero," says Dr. Kenneth Rosenfield, Bader's cardiologist at Massachusetts General Hospital. Bader says she was surprised you can save someone in cardiac arrest without doing mouth-to-mouth resuscitation. "And the fact that you have to deliver the compressions that fast was news to me. It's certainly different than what I learned as a Girl Scout back in 1968," she says. Many people are under the misconception they need formal training to help someone in cardiac arrest, says Allyson Perron, advocacy director for the American Heart Association in Massachusetts. She says while it's best to take a CPR class (they last about three and a half hours), just doing chest compressions can get a person's heart going again. "We still encourage full CPR with mouth-to-mouth if you can do it, but doing what you can is better than doing nothing at all," Perron says. "There are tragedies when people don't know what to do. A high school boy went into cardiac arrest in Massachusetts in December, and he died because no one on the scene knew what to do. Sadly, we hear these stories a lot." For a quick, crash course on how to perform CPR, the University of Washington has a short video. You can find a CPR class in your area on the Web sites of the American Red Cross and the American Heart Association. The heart association started the "Hands-Only CPR" campaign last year, encouraging people to deliver chest compressions 100 times per minute. The song "Stayin' Alive" has about that many beats per minute. Bader says doctors at the hospital where her husband was treated have an alternative song. "They told me they do CPR to 'Another One Bites the Dust,' which also has about 100 beats per minute," Bader says. "Doctors have kind of a dark sense of humor." So does Bader like the song "Stayin' Alive"? "I do now," she says. CNN's Jennifer Pifer Bixler contributed to this report.